When I saw this snake stretched out on the road at night, I first thought it was a gophersnake, based on a quick glance at size and shape and color pattern. I got out of the car to get a closer look and realized that it was a lyresnake, and I had never seen the lyresnake species from this area, so, you know, yay. A man about my age and his two sons pulled up in a car behind me and someone asked what kind of snake it was. When I told them they got excited because it was a species they had never seen either. At this point the snake decided it was time to go, but we hadn't gotten any decent pictures yet, so the four of us wrangled it into sitting still for a few minutes. An hour or so later I was driving this stretch of road again and saw what at first seemed to be the same snake again in almost exactly the same place. 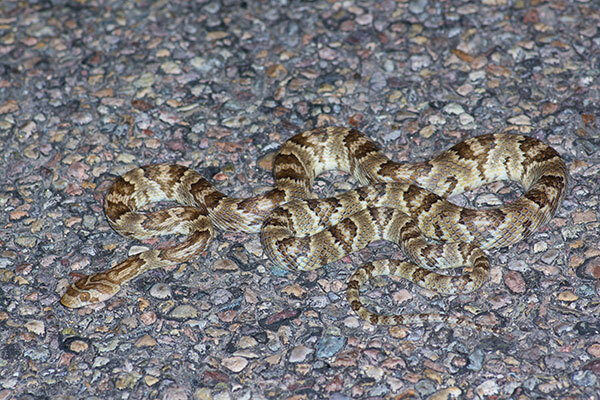 But this time, it really was a Sonoran Gophersnake.